How to edit image comment in docPrint preview application? You can use VeryPDF docprint preview application to add image comment on the files before you send the files to the real machine. You can also use VeryPDF docprint to edit image comment on current page in the Annotate Document dialog box. First of all, to check that all the buttons on the toolbar in the Annotation dialog box are with color. If not, you should click the comment button before you edit image comment on current page . If you want to move the selected image, you can keep the left key down with the mouse and drag it to the proper place, depending on your priority. If you want to enlarge the image, you can move the mouse to the corner of red rectangle. When a cursor with two open arrows appears on the screen, you can keep the left key down with the mouse and drag the border of the rectangle to adjust the image to the right size you want. If you click the right key with the mouse, then, you will see a menu appear on the screen as following. Then you can copy, delete, cut, etc. the image. If you are careful enough, you may point out that there is no paste option on the menu. Don’t worry, you can paste the image after you copy or cut the image on current page by pressing Ctrl + V.
To copy the image, you can choose Copy or press Ctrl+C to copy the selected image to the clipboard>click on the current page other than the image>press Ctrl+V to paste the image> drag the image to a proper place on current page . If you want to cut the image, please choose Cut or press Ctrl+X. To delete the image, you can choose Delete, or press Delete key on the keyboard. If there are lots of comments overlapped on the current page and you want to set a image comment as the background, you can select Set to Background. On condition, if you want to set the selected image comment as the foreground comment, you can choose Set to Foreground. If you want to to make each of the new image comment on current page with the properties you have saves just now, you can choose Make Properties Default. Then, each time a new image is added, the original properties should be the saved one. If there are several comments close together, you may need the option Lock/Unlock to help you edit the image by locking the rest comment on current page. If you choose Properties, the Properties dialog box will appear on the screen for you to set the properties of the selected image. 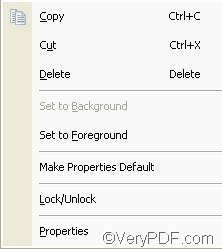 On how to set the properties, you can refer to related articles on the knowledge base of VeryPDF at the following website: http://www.verypdf.com/wordpress . 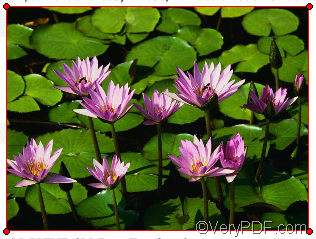 To get more information about VeryPDF docPrint, you can visit http://www.verypdf.com/artprint/index.html. You can also download the newest updated version of VeryPDF docPrint as well as the free version of other VeryPDF software applications. How to print files of AutoCAD to ps? How to print OpenOffice documents of ODT to Bitmap image? This entry was posted in docPrint Pro and tagged edit image. Bookmark the permalink.